Baccarat is a casino gambling game which involves absolutely no strategy, but system players love to fly in the face of logic. The purpose of this page is to provide an introduction to the game of baccarat as well as to explain why baccarat gambling strategies don’t work. Baccarat is a card game similar to blackjack in some ways, but baccarat lacks the element of skill that makes blackjack such a thinking man’s game. That being said, baccarat has its charms. Baccarat has been around forever. It’s especially popular with Asian gamblers, and it’s also popular with high-rollers, which explains why none of my friends play much baccarat. Each player gets two cards, and the point values of those cards is totaled. The right digit of that total is the player’s score. For example, if a player is dealt a 7 and a 9, she has a total of 16, but only the number on the right counts, so her score is 6. A baccarat score will always be a number between 0 and 9. Players do have the option to “hit,” or take another card, just like in blackjack. But in baccarat, a player is only allowed to hit once. And if either the banker or the player has a total of 8 or 9, the player is NOT allowed to hit. Also, players don’t really have the “option” to take a hit. They receive an additional card based on whatever their score is. If the player has a 5 or less, she gets another card (unless the banker has a total of 8 or 9). Otherwise, her total stands. The scores are compared, and either the player or the banker will have a higher score, although it’s also possible that they could tie. The only real decisions a baccarat player gets to make is who to bet on. A baccarat player can bet on the player to win, but she can also bet on the banker to win. She can also bet on the player and the banker tying. If you bet on the banker, winning bets pay off at 19 to 20. In other words, the house keeps a 5% commission on this bet. If you bet on the player, winning bets pay off at even money. There’s no commission. If you bet on a tie, the winning bet pays off at 8 to 1, although this might vary from one casino to another. Bets on the player and/or the dealer are considered a “push” in the case of a tie, and the bettor receives her bet back. The only decision a baccarat player actually makes during a game is which bet to place, and each bet has a specific mathematical house edge. None of the bets offer even odds, so baccarat is always a negative expectation game. To practice good baccarat strategy, just choose the bet with the lowest house edge, and never place either of the bets with the higher house edge. A bet on the banker has a house edge of 1.06%, making it the best available baccarat bet. The best strategy for baccarat, mathematically, is to always bet on the banker. A bet on the player has a house edge of 1.24%. You’re only giving up 0.18%, but there’s no rational reason to give up any percentage to the house. A bet on a tie has a house edge of 14.36%, making it one of the worst bets in the casino. You’d be better off playing roulette or almost any slot machine. 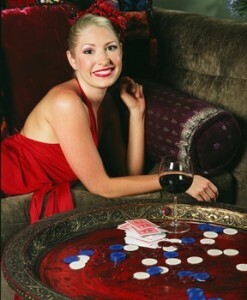 Various bogus baccarat strategies and systems are available for sale on the Internet. If you’re in the mood to waste some money and support a con man, buy one of these systems. Just remember that by using the system, you’re not changing the math behind the game at all. You’re just putting money in the pockets of someone who’s either lying or has a limited understanding of math.